The following is an excerpt from my new fantasy novel, The Lion's Crown (Amazon link). Sir William Carlyle and his companions have been tasked with exploring the mysterious Hobswood Forest. The party has crossed through the Bleaklands, the bog that rings the forest, and have made camp for their first night inside the wood. Everyone but Owen sprang to their feet. Swords were drawn, but William was at the pile of packs. He pulled out the torches and tossed them to the others. They lit the torches in the fire, but before anyone could act, the dark shape swept toward them. Sir Alfred yelled out as it whipped by him, but his torch was already lit. He lashed out, and the flame licked at the edge of the shadow. A scream like wind rushing through a cavern pierced their ears. The wraith dashed past them and up onto the boulder. It glided across the rock and down into the ravine beyond. The four knights stood with their torches held aloft, facing the boulder. George armed himself with a brand from the fire and pushed Penny and Owen back behind him. They spread out in a circle around the fire and stood silently, watching and waiting. Minutes passed without anything happening, but the second their guard began to slack, the thing rushed out from the trees on one side of their camp. Again it charged by them, seemingly trying to graze them without getting caught by one of the torches. But as it whipped past George, he flung his burning stick toward it. The brand hit the wraith squarely and passed through it, but another chilling scream told them it had been injured. It sped around the camp in a circle, making quick, jerky advances ever few seconds. Sir Stephen cried out as it touched his leg, but he was able to graze it with his torch before it could dart away again. He fell to one knee but he kept his torch at the ready as he rubbed his calf where the wraith had stung him. Again and again, the wraith tried to graze them, and even though Harold, George and William each also suffered the thing’s touch, they were able to retaliate every time. The wraith’s dizzying rush began to slow, and as it made one final advance toward Sir William, he brought his torch down like a headsman’s axe. The burning end of the torch seemed to pin the wraith to the ground, and as it flailed, William took several more stinging touches before it finally fell still. William collapsed onto the ground next to the wraith. His forehead was glistening with sweat, and his face was twisted in agony. “Is it dead?” Harold called, hobbling over. They all gathered around the thing for a better look. Its edges were indistinct, but the body was roughly diamond shaped. A wispy tail trailed behind it, but they couldn’t make out any eyes, mouth or limbs. Without it moving, it was almost impossible to see. It was a shadow on the ground, nothing more, and Penny had to fight an impulse to look around for the real creature that was casting that shadow. As they studied it, the wraith began to thin. The shadow grew lighter, and a moment later it dissipated as a breeze blew across the camp. It drifted away like smoke, and they were left staring at an empty patch of ground. “By the lion’s tail,” Sir Alfred muttered. The others mumbled their agreement and rounded the fire back to the bedrolls lined up along the base of the boulder. George gave Penny a light kiss before he left, and she blushed as she glanced over at Sir William. Penny felt strange with Sir William’s back pressed against hers, but after a few minutes her discomfort subsided. The warmth was reassuring. She felt him fumbling with something, and a moment later it was pressed against her arm. “Here, take it,” he said. She reached around and took the object with her other hand. It was Sir William’s knife. She slid it out of the leather scabbard and looked at the blade. “But wraiths aren’t hurt by weapons,” she said. “That’s not the same. He’s older than me and a man. If he were normal….” She let the thought go. “Friends,” Penny said. She looked left then right, scanning what could be seen in the ring of light cast by the fire. 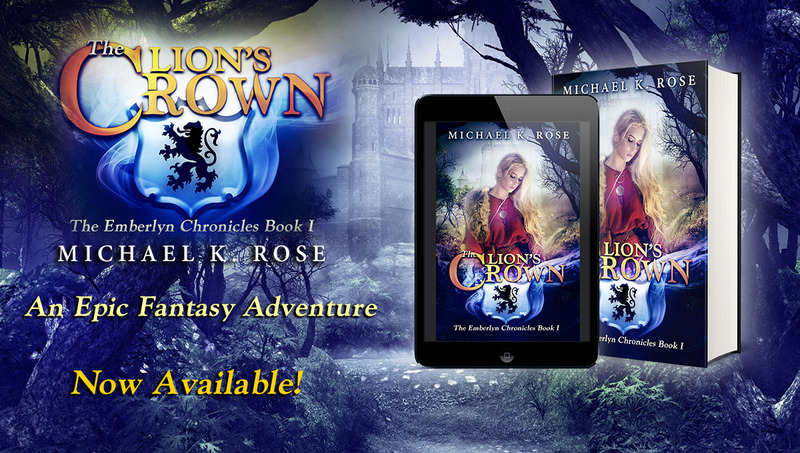 The Lion's Crown is only 99¢ through the end of April!